If your doctor has told you to take statins to lower your cholesterol to prevent a heart attack, you may feel like you have no choice. And, if you keep abreast of health news, you'll have read that statins increase your risk of getting cancer. But how real is this really - and why? It all starts with cortisol - the stress hormone that prepares you for fight or flight. And, just like emergency services are given priority over others, there's pretty much an open line when it comes to cortisol in your body. When you're stressed, cotisol production is prioritised at the expense of other hormones made from the same precursor, pregnenolone. It so happens that pregnenolone is made from cholesterol, which in turn is made from LDL. So, the more stress you're under, the more cortisol your body makes, and so the more cholesterol it needs to produce. Now, when you take statins to block the production of cholesterol, it increases cellular stress. Furthermore, cholesterol plays a major role in constructing mitotic spindles that pull chromosomes apart correctly... Increasing the chance for cellular mutations when you block cholesterol production, which can result in tumours. So, taking statins doesn't seem to make a lot of sense - when the real problem starts with cortisol spikes. As you know cortisol goes hand-in-hand with stress. It doesn't seem to matter much what kind of stress - whether you're being chased by a tiger, you're running late for a major meeting, or you're constantly consumed with anxiety and worry - they all trigger the production of cortisol in your body. So, it makes sense to reduce your stress levels so that you can in turn reduce the level of cortisol in your blood - especially if you're chronically stressed (you suffer from anxiety or lead a stressful life). 1. Remove inflammatory foods from your diet as much as possible. These include sugar, refined carbs - like flour, pasta, white rice, packaged foods and processed foods. 2. Take a powerful antioxidant, a natural anti-inflammatory like curcumin, and an adaptogen formula daily to help regulate your hormones. 3. Exercise every day. It's one of the best ways to reduce stress and the effects of stress on the body. It doesn't have to be intense exercise, just moderate and for 15-20 minutes per day. 4. Find a way to help you manage stress better - like yoga, acupuncture, deep breating exercises or meditation. 5. Get 7-8 hours of restful sleep every night. Take a natural sleep formula to help you achieve this if you suffer from anxiety and often lie awake at night. 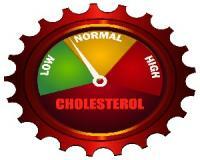 Reduce cortisol in your body and your cholesterol levels will lower too.